Our Dentistry of Colorado – Belmar office is located in Lakewood, CO in the heart of the Belmar shopping, dining and entertainment district. Many of our patients are busy working people or students, attending Lakewood schools or working at the many businesses in the Belmar area. So, at Dentistry of Colorado – Belmar, we offer appointment times early mornings, after work and on the weekends. In addition to most dental insurance plans, we offer a our Dental Advantage discount plan. Our passion is complete oral health care for our patients. This comprehensive approach means treating all aspects of a healthy mouth including bite, soft tissues, gums, and position of teeth. Your overall health history is important as well. We’ve been patients too, we get it. If you’ve got a dental phobia, we can help you overcome it with our expertise in sedation dentistry. For your comfort and ease, you can choose from oral sedation (a pill to relax you), IV sedation to put you to sleep, or nitrous oxide (laughing gas). Not enough hours in the workday? Not a problem. You are important to us and we want to make it convenient for you to maintain good oral health. We offer early morning and evening treatment times throughout the week to accommodate your schedule. We have weekend appointments available as well! As a patient of Dentistry of Colorado – Belmar, you won’t be asked to visit multiple offices to complete your treatment. We know your time is important and our office can meet all of your dental care needs including fillings, implants, crowns, veneers, root canals, oral surgery, gum disease, orthodontics and more. Teachers - We Have A Discount Just For You! We appreciate the teachers who serve our families. 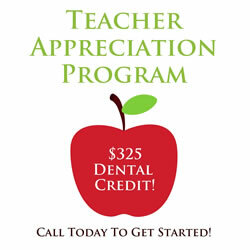 And for all you do, Dentistry of Colorado – Belmar offers all current and retired teachers a $325 dental credit towards your next visit and treatment. At all of our Dentistry of Colorado locations, we don’t believe in unnecessary treatment. Our approach is to do only what is essential to maintain your oral health and minimize any future dental problems. We will be honest with what we see as a concern and discuss the pros and cons of the various treatment options. If you do need advanced or restorative treatment, we use the latest technology to give you back your smile in the least intrusive way possible. Stop in or contact our office in the heart of Belmar anytime! We look forward to working with you!